It’s kind of spooky how Halloween sneaks up on us year after year…BOO! 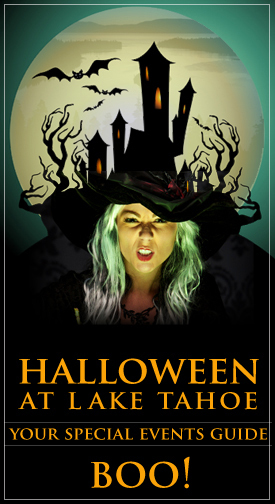 That’s right, it’s here again and with tons of Lake Tahoe Halloween events to get you into the spirit of the holiday. This year there will be both family activities and adult-only parties for the 21+ crowd, from the Not-So-Scary Haunted House to the Halloween Bash at Jake’s On the Lake. Halloween in Lake Tahoe has never been spookier! Many events are free or low cost, so peruse our event list and find the one that is just right for your group of mischievous monsters. The 35th annual Freaker’s Ball is one of Lake Tahoe’s most popular Halloween parties! There will be a costume contest unlike any other with $10,000 in cash and prizes for the freakiest party-goers. Get your freak on with live music provided by Glam Cobra, plus sensual body painting and go-go dancers. Experience four parties in one location—the main Convention Center, BLU Nightclub, Opal Ultra Lounge, and the Haunted Zone & Party Pit. It’s safe and secure Halloween fun for the whole family! Take the kids trick-or-treating from room to room, let them burn off some energy in the bounce houses provided the Boys & Girls Club, and get cute photos of them in their costumes, plus enjoy face painting, balloon artists, and much more! There will be live music by Jesse Kalin and entertainment for the grown-ups too! The Parade leaves the Truckee Train Station at 6:00 PM, but come early if you want to sign up for the costume contest. The Parade course leads through downtown streets and ends at the Community Art Center. Once there, kids of all ages can Trick-or-Treat through the Community Art Center for candy and treats. This is a fun event that the whole family will love! This event is great for young children and their families. The haunted house is playfully scary and great for kids with a low-scare tolerance. You can also enjoy carnival games and watch a movie. Every kid is guaranteed to come away with a bag full of treats and prizes! Annual Pumpkin Patch at Rideout Community Center in Tahoe City. Plenty of fun for the entire family including carnival games and a bounce house, pony rides and hay rides, pie eating contest and delicious BBQ, and PUMPKINS of course! Head to downtown Tahoe City for an evening of Trick-or-Treating in a safe, friendly, and well lighted location. Check in at Heritage Plaza for a trick or treat bag and a glow necklace from the Creatures of the Rec Dept., then take the kids trick-or-treating at other local businesses. Adults 21+ are welcome to party the night away at the Halloween Bash at Jake’s on the Lake. Wear your best costume and you might just win a prize! Enjoy The Psychedelic Scientist’s LAZER LABORATORY, plus live music by *micah J – the funky breaks MASTER.